In a survey which was conducted about a decade ago on tree species used as sources of fuelwood in Ilorin environ, Vitellaria paradoxa C. F Gaerten and Parkia biglobosa (Jacq.) Benth. stood out as the most preferred species for domestic cooking and baking of bread. In the present study, the conservation status of these 2 species was determined along with that of Daniellia oliveri (Rolfe) Hutch. & Dalz., which is not a popular choice for use as firewood. The frequency of V. paradoxa dropped from 62% in 1989 to 40% in 2011. That of Parkia biglobosa dropped from 88% to 60%, while the frequency of D. oliveri rose from 62% to 70%. V. paradoxa, therefore, appears to be vulnerable or threatened while P. biglobosa is near threatened. The frequency of D. oliveri rose from 62% to 70% hence the status is of least concern. The data obtained on the tree height, trunk diameter and crown diameter agreed with these conclusions on anthropogenic impact on these species. There were relatively few tall trees, with very wide trunks and crowns in V. paradoxa and P. biglobosa, while D. oliveri had fairly many more tall trees with wide trunks and crowns. International Journal of Applied Science is an open access, peer reviewed and refereed international journal published by ScienceVier Canada. The main objective of IJAS is to provide an intellectual platform for the international scholars, Scientist and researchers’ .IJAS aims to promote interdisciplinary studies in applied sciences and become the leading journal in science field. 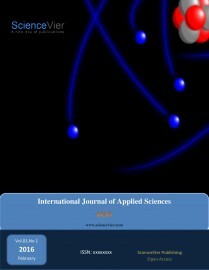 The journal publishes research papers in the fields of science and technology such as chemical sciences, computer science, mathematics and statistics, engineering, environmental sciences, astronomy and astrophysics, Chemistry, Earth and atmospheric sciences, Physics, Biology in general, Agriculture, Biophysics and biochemistry, Botany, Forestry, Genetics, Horticulture, Husbandry, Neuroscience, Zoology, Engineering, Robotics and Automation, Materials science, Mechanics, Health Care & Public Health, Nutrition and Food Science, Pharmaceutical Sciences, and so on. Few critical review papers will be published if the author had done considerable work in that area. One of the journals aiming to bring out research in both Science and engineering research with wider scope. International journal to bring out research articles that seeks to uncover the science core technological advances. A journal that aims to cover all major domains including general science and engineering. Offering rapid review and publication, mostly the submitted papers will be published within two months. Online availability throughout the year enabling the user to download articles. State.The samples were sundried and ground into powder and sieved. was 30.50% in M. procera, 28.8% in P.roseusand 29.2% in C.cibarius. moisture content (18.01%) which was significantly different (P<0.05) from others. their use as raw materials to the pharmaceutical industries is recommended. (p<0.05) higher in pap wrapped with leaf than nylon at day 3, 5 and 10 of storage. best retained when nylon are used to wrap the pap than leaf. placing of the two species in different genera. urgent step need to be taken to avert its risk of extinction. Maggots of the blowfly have been used for the treatment of antibiotics resistant wounds. The total protein concentration, isolation and characterization of biologically active proteins and peptides from Maggot saliva were determined by Bradford and SDS-PAGE gel electrophoresis. The total protein concentration was 430.51 mg/ml. SDS-PAGE gel electrophoresis of Maggot Excretion/Secretion revealed the presence of 5 proteins and peptides ranging from 17KDa to 121KDa. These results are obtained side by side with a proteins and peptides standard reference. The bands of proteins isolated were Beta galactosidase 121 KDa, Glycosylated bovin serum albumin 93 KDa, Ovalbumin 40KDa, Cardonic anhydrase 36 KDa, Beta lactoglobin 23 KDa and Lysozyme 17KDa. Maggots have long been used as a traditional way of cleansing and healing gangrenous wounds. Blowflies’ abundance and antibacterial activities were determined using baited traps and agar cup plate technique. The family calliphoridae was the most abundant in all the sites sampled. The total of 5755 calliphorid flies captured belonged to two genera, Lucinia robineau (81.49%) and Chrysomya megacephala (18.51%). There was a significant difference in their abundance and a positive correlation between abundance and the two species with relative humidity and rainfall and a negative correlation with temperature. The isolates from infected wounds and whitlows were Pseudomonas earoginosa, Staphylococus aureus, Klebsiella pneumoniae and Staphylococcus epidermidis. Antibacterial susceptibility screening showed that, the maggot saliva/excretion was able to inhibit the growth. The zones of inhibition recorded was Pseudomonas aeruginosa was 24mm while Ampiclox (control) 37mm; Staphylococcus aureus was 20mm while Ampiclox (control) 31mm; Klebsiella pneumoniae was 27mm while Ampiclox (control) 39mm and Staphyloccocus epidermidis was 24mm while Ampiclox (control) 28mm. The result of the antibacterial susceptibility screening also revealed that, the greatest effect of the maggot saliva/excretion was obtained against K. pneumoniae while the lowest was obtained against S. aureus. Minimum Inhibitory Concentration (MIC) was between 40mg/ml and 60mg/ml while Minimum Bactericidal Concentration (MBC) screening showed that Pseudomonas earoginosa, Staphylococus aureus, Klebsiella pneumoniae, Staphyloccocus epidermidis have the same bactericidal concentrations of 60mg/ml each while Ampiclox (control) had 40mg/ml. Given a simple graph on n vertices, currently 1.7159n is the best upper bound on the number of minimal dominating sets. This bound has been improved for some classes of graphs. In this article, the bound 1.7159n is improved for the class of simple loop-free connected graphs having pendant vertices, leading up to the corresponding results for simple loop-free connected hypergraphs. The transport equations representing the rate of change of discontinuities in the normal derivatives of the flow variables are obtained along bicharacteristic curves in the characteristic manifold of the differential equations governing the flow of a chemically reacting gas. The propagation of these weak discontinuities is discussed in particular cases of plane, cylindrical and spherical geometry. The effects of the chemical reactions, the magnitude of initial discontinuity, the initial curvature of the wave front and the upstream flow Mach number on the propagation of these weak discontinuities are investigated. The generalized sonic conditions for a three-dimensional unsteady self-sustained detonations wave are derived by defining sonic locus as a limiting characteristic surface of the governing hyperbolic equations embedded in the reactive zone at a finite distance behind the shock. Two compatibility conditions are derived by considering Whitham’s shock ray co-ordinate system as a front attached co-ordinate, which are necessary to determine the motion of both the lead shock and the sonic surface. The domain of influence of reactive zone is bounded by two surfaces; the lead shock surface and the trailing characteristic surface. The geometry of these two surfaces plays an important role in the underlying dynamics. In this paper, we investigate first and second law of thermodynamic analysis of variable viscosity hydromagnetic, which has Couette flow with permeable walls. The analytical expressions of the dimensionless velocity and dimensionless temperature are derived by using the Homotopy analysis method. Our analytical expression of the dimensionless velocity is compared with the exact solution and a satisfactory agreement is noted. We also derive the analytical expressions for skin friction coefficient, Nusselt number, Entropy generation rate, Bejan number. The HAM contains the convergence control parameter, so we can easily extend to solve other MHD fluid flow problem in engineering and science. Fish processing is a crucial sector to meet the nutrient needs for humans, but it generates a significant amount of the estimated 50% of total waste. It follows the same time a problem of dumping of waste in different environments which increases environmental pollution and in particular the water environment. Our work aims to study the physicochemical quality of sardine waste (edges, heads and guts). Then, we seek to exploit these coproducts as medium culture for microorganisms such as Lactobacillus and E. coli. In this case, two universal mediums were prepared with the isolate obtained from fish in the place of peptones of the conventional mediums. The physicochemical analyzes showed that the isolate obtained has a high biological value (rich in essential amino acids). The results indicate that the use of this isolate must be accompanied with other essential elements of culture (vitamin compounds, essential amino acids, minerals) as growth factors to optimize the growth of bacteria involved. This work allowed us to have a recovery method that reduces the risk of pollution caused by discharges of different fish processing industries and we contribute to the development of biotechnology. Background. Allergic asthma and rhinitis, atopic dermatitis, urticaria and food allergy are genetic diseases of infants and children. Several investigators have provided evidence for a genetic localization for atopy. Babies of atopic parents are at high risk of developing atopic diseases, however the phenotypic expression of such diseases varies widely, being very mild in some infants and children, severe and frustrating in many, even life-threatening in others, being also common,disabilitating, and chronic. An investigation was carried out in Livestock station at Khizarabad, Sargodha Pakistan. An experiment was conducted to determine the sodium status in blood plasma and milk of lactating cows in four sampling phases (October, November, December and January). Milk and blood plasma samples were collected in four sampling phases of winter seasons of 2014. Transfer of minerals from blood plasma to milk possessed many effects on ruminants so there is need to elaborate translocation quantity of minerals to overcome diseases related to ruminants. An experiment was conducted to determine the sodium status of soil and forage during four sampling periods (October, November, December and January) in livestock station at Khizarabad, Sargodha, Pakistan. Forage plants and soil samples were gathered in four sampling periods of winter seasons of 2014. Highest sodium level in soil (98.496 mg/kg) was found in October and forage sample show highest sodium (0.0802%) level in October. Similarly lowest sodium level in soil (64.584 mg/kg) and forage (0.300%) samples was also found in same sampling period of January. Results of the present study showed that sodium concentrations in soil and forage samples were higher than critical levels. Transfer of mineral from soil to forage showed serious effect on plants and also on ruminant which consumed these plants so Further studies are required to find out the exact requirement of minerals for the area under study for forage productions and to cope with diseases in small ruminants. Medicinal plants are very important in all over the world to cope against different types of diseases. Medicinal plants are utilized as folk medicine to heal injuries and cure diseases. Therefore, the aim of present study was to compare the biochemical and physiological attributes of root, leaves, fruits and seed of olive (Olea europaea) and Amaltas (Casia fistula). In this regard, different parts of olive plants such as root, fruit, seed and leaves were collected from soon valley and different parts of amaltas were collected from University of Sargodha and analyzed. Biochemical and Physiological attributes such as protein, amino acid, total sugar, reducing, non-reducing sugar and different mineral ions such as Na+, K+, Ca2+ were analysed. In olive and amalatas plants, sodium and potassium were observed high in fruits, roots, leaves and seeds. The presence of these minerals helps in plant growth and fruits production. Concentration of reducing and non-reducing sugar was observed high in leaves and fruits of olives and amaltas and minimum in seed of olives and root of amaltas. The protein contents were observed high in root of olives and minimum in seed of olive plant while maximum in leaves and fruit of amalats. Potassium and calcium contents were observed high in seed of olive plants while calcium were observed high in leaves of olive plants. The comparison of physiological and biochemical status of root, leaves, fruits and seeds of olive plants indicated the important values of different parts of the olive and amaltas and their significance. This study helps to recommend the different parts about their medicinal values. produce IgE antibodies. The phenotypic expression of allergic disease ensues from an elaborate interrelationship between the atopy-prone genetic constitution of a child and the experienced environment that surrounds it. Prevention of atopy could potentially be met by selectively interfering with the genetic and environmental factors that appear to be responsible in concert for the final phenotypic expression of atopy. Human milk has been for centuries the only way of feeding human neonates. Since the beginning of this century, CM formulas have become a common breast milk substitute when mother’s milk was not available. During this century and especially in the last decade other formulas have been developed in order to reduce the antigen load and therefore the risk of sensitization. In this paper, we will briefly summarize recent data on the environmental factors triggering atopy. In addition, we will report recent knowledge on atopy prevention, also reviewing the so-called hypoallergenic formulas.